The new mobile computer from Wacom packs a set of powerful creative tools into a lightweight device. 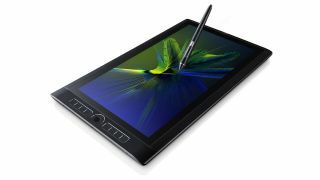 Thanks to their fluid and natural digital pencil drawing experiences, the Wacom tablets have become a rightfully become a favourite of the design community over recent years. So it's welcome news that Wacom have now unvelied the MobileStudio Pro, a lightweight device that lets 2D, 3D and CAD artists and designers create anywhere. Equipped with an enhanced set of powerful features, and a 3D camera included with certain models, the Wacom MobileStudio Pro offers an unparalleled level of feel and accuracy. Complete with the newly designed Wacom Pro Pen 2, which delivers four times higher accuracy and pressure sensitivity, users can experience lag-free tracking that will speed up their workflow. "Unlike most general-purpose mobile tablets created for the mass market, Wacom’s MobileStudio Pro was designed specifically for the needs of the creative professional and how they work," says Ed Neumann, Senior Vice President of Wacom’s Creative Branded Business. "Our long-standing relationship with the professional creative community enabled us to develop a game-changing solution for the creative market that exceeds customer expectations and provides the best, most natural and precise creative experience imaginable," he adds. Six configurations of the MobileStudio Pro are available to choose from. These include four 13.3" models that deliver maximum mobility along with high performance and colour accuracy, plus two 15.6" models that offer a larger working area. Bundled with Windows 10, these new Wacom tablets have the power to run Photoshop, Illustrator and demanding 3D creative software applications. In fact, 3D modellers will find a host of features suited to their needs, including the ability to capture 3D scans which can then be built in platforms such as ZBrush or Fusion 360. Certain models even include the Intel 3-D RealSense camera. "Being able to create anywhere is the trend that can change everything about 3D art, whether you're creating for film VFX or arch-viz or VR, the advancement in new tech like the Wacom MobileStudio Pro is great news," says Ian Dean, the editor of 3D World magazine. "I'm particularly excited about the inclusion of the 3D camera on the higher spec model, this could really help push on the creation of new VR projects as we can scan direct to ZBrush while out of the studio." Time-saving productivity features round off this Wacom MobileStudio Pro release, with convenient pen buttons allowing users to quickly set-up one touch shortcuts. The MobileStudio Pro can also be attached to any Mac or PC to be used as a standard Cintiq display. With prices starting at $1,499/ €1,599/ £1,399, the MobileStudio Pro is slated for a release in late November. Find out more on the Wacom site, and be sure to check back into Creative Bloq for a more detailed review when the devices are available.